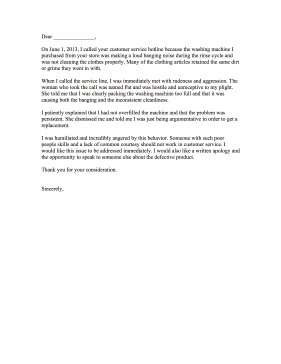 This complaint letter recites a story about bad customer service and suggests a reasonable outcome. On June 1, 2013, I called your customer service hotline because the washing machine I purchased from your store was making a loud banging noise during the rinse cycle and was not cleaning the clothes properly. Many of the clothing articles retained the same dirt or grime they went in with. When I called the service line, I was immediately met with rudeness and aggression. The woman who took the call was named Pat and was hostile and unreceptive to my plight. She told me that I was clearly packing the washing machine too full and that it was causing both the banging and the inconsistent cleanliness. I patiently explained that I had not overfilled the machine and that the problem was persistent. She dismissed me and told me I was just being argumentative in order to get a replacement. I was humiliated and incredibly angered by this behavior. Someone with such poor people skills and a lack of common courtesy should not work in customer service. I would like this issue to be addressed immediately. I would also like a written apology and the opportunity to speak to someone else about the defective product.